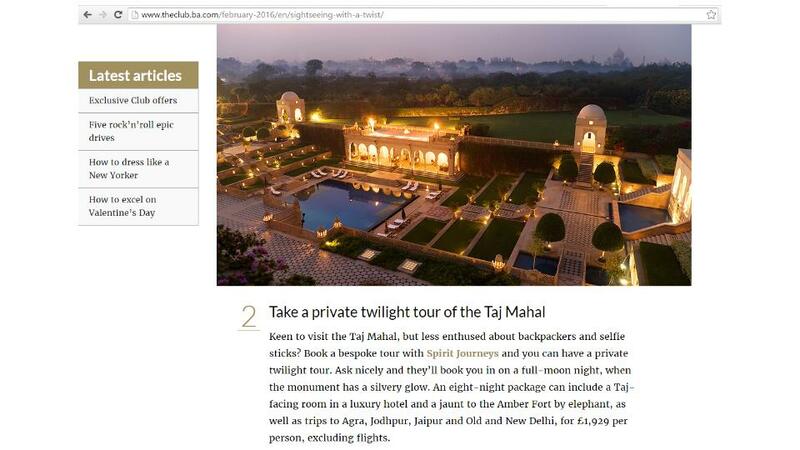 How we got a travel startup in British Airways magazine. Getting your name out there and in front of the right people is essential for new startup businesses. Getting coverage in the press can be one of the best ways to do this. These days most magazines and newspapers have a web edition as well as print so one article can easily earn you double exposure plus links back to your website. We provide managed digital marketing services for startups and small businesses. This involves writing their website and blog content, managing their social media accounts and running online advertising for them. We also try to get our digital marketing clients more exposure by looking for opportunities to connect them with journalists and to generate press coverage. Partly we do this through profiling journalists and publications. By looking at the type of stories journalists, magazines and websites publish it is often possible to identify journalists or publications whose interests overlap with the products or services one of the business we represent offers. So, for instance, we have a client at the moment who is about to launch a new range of organic health drinks. We are therefore looking at journalists, magazines and websites that regularly write about organic food, nutrition and healthy eating to review the products and feature the brand’s story. One of the tools we use to profile journalists is social media. As well as using specialist tools like Cision, we often do searches on social media networks like Twitter to find journalists in our target topics. One particularly useful tool on Twitter is the #journorequest hashtag. This is pretty much what it sounds like, it is journalists asking for information, contacts or comment for stories they are working on. We also have the Journo Request service setup which sends us a daily email of requests journalists are making on Twitter sorted by category. 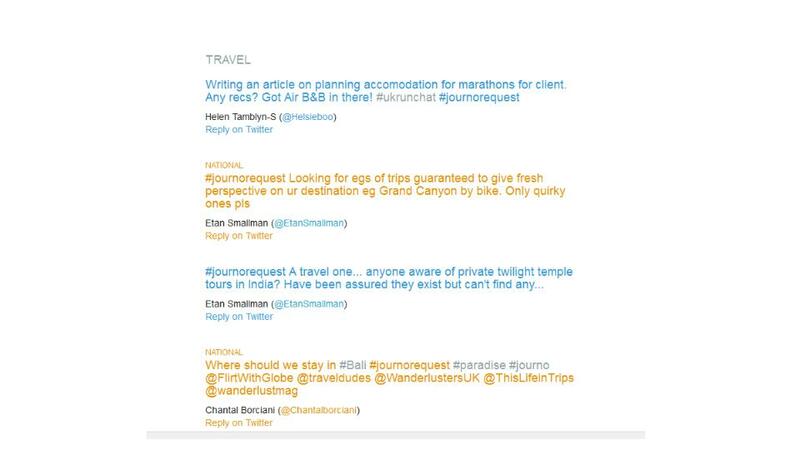 As we were working with a new travel startup called Spirit Journeys Worldwide who had asked us to help with their online marketing we were keeping an eye on travel journalists making requests. One of the services Spirit Journeys offer is bespoke tours to India including tours of temples and spiritual sites so when we saw a journalist struggling to find information about tours of temples in India we knew we had a good fit. After checking with our client that they could provide the information the journalist needed we used Twitter to make contact with the journalist and to offer our client’s help. Once contact was established we passed the details onto Spirit Journeys who put together a bespoke holiday package to suit the journalist’s needs. A couple of months later this package was featured in the British Airways Club Magazine February edition as one of 5 Sightseeing With a Twist holidays. This was a case of being able to spot a journalist with a particular need for information and quickly match them to one of our clients. Because we were responding to a question rather than speculatively sending out a press release there was no need for any hard sell on our part. The journalist got the information he needed and our client got some great exposure for their new business among their target customers. Not only did the feature in the British Airways Club Magazine get them great exposure, and a great backlink, they were also able to sell a number holidays directly from it. 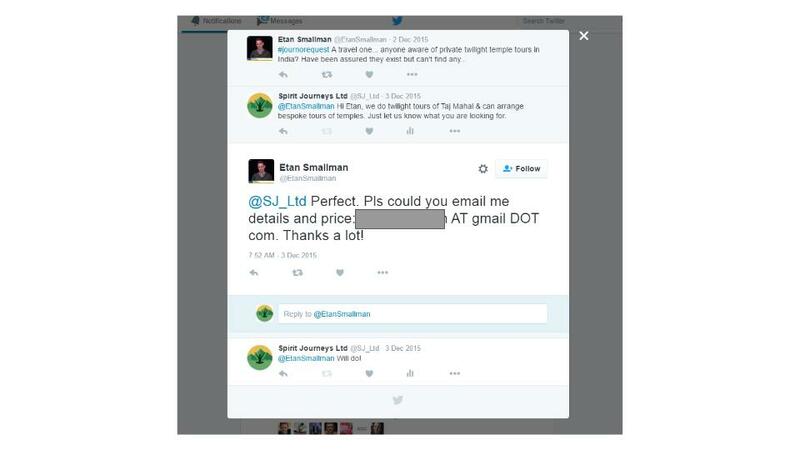 As the example above illustrates responding to Journalists requests on social media can be fantastic way to get press coverage for new startup businesses. However, it does depend on spotting the right journalist, at the right time, asking the right questions. Many of the journalists will be on deadlines when they are asking the questions so you also have to be able to respond very quickly. Having someone monitoring the requests, and using tools like the email alerts, obviously helps with this. Not every business is going to be able to respond to journalists requests on a regular basis. It may be that your product is very technical or aimed at very specific markets and simply not something that people are going to ask about on a regular basis. Similarly if you are launching a brand new project you would have to be pretty lucky for a journalist’s request to coincide with your launch date. It therefore makes sense to continue with traditional press releases and press outreach and to see fulfilling journalist’s requests as a useful top-up to your main marketing strategy as and when they come along.